I had a player in my Wednesday night game say the phrase above. All jokes about taunting/daring the DM aside, I was surprised to hear him say it. First, some background on the game itself. The PCs had stumbled upon an ancient elven tomb only recently unearthed in the Faded Forest, a Brelish woodland in the Eberron Campaign setting. They had been seeking the sheriff of a nearby town to ask questions of him regarding another matter only to hear he had traipsed into the forest with some men, in search of two missing children. The children had discovered the burial site first, fleeing some giant spiders, and thus everyone else had followed their trail as well. I’d been wanting a reason to give the guys a nice little dungeon crawl and their search for the sheriff provided the perfect impetus. 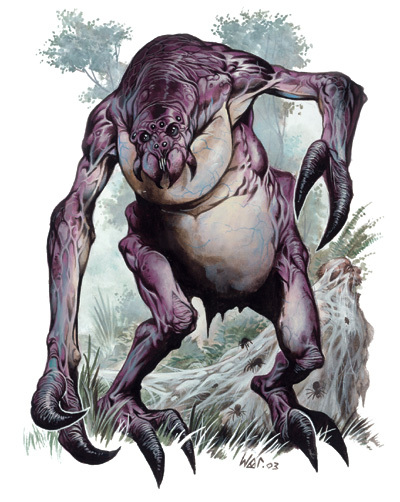 Did you know that female Ettercaps can be intelligent enough to gain class levels? The dungeon itself was some fine craft on my part. 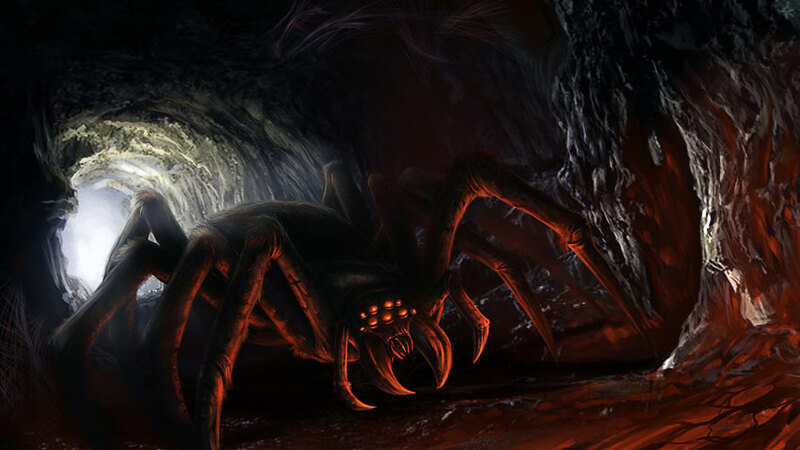 An environment controlled by two rival monster groups, the first being some Troglodytes and the second being some giant spiders led by a female Ettercap who, after discovering the entrance, had decided to move from her earlier forest canopy home into the fortified crypt. There were lots of clues that the two forces had been warring with each other throughout the crawl. The children had actually been captured by the spiders (thank goodness as they actually wait to eat their food) and the sheriff, with his men from Mistmarsh, had almost been defeated by the Troglodytes. They’d been forced into a side room. Enter the players who had become a rescue party whether they knew it or not. When I approached the creation of the dungeon I wanted to be certain there were reasonable explanations for everything found there. In order to do this for the Troglodytes I imagined a scenario where some tunneling creature had opened an entrance from the Upperdark into one of the far burial chambers, a long tunnel of an entrance. The Troglodytes had stumbled upon this tunnel and decided to make the crypt home, not realizing how truly close to the surface they were. The players did discover this downward sloping route but even during their discussion about whether to venture further the above quote wasn’t yet uttered. Well, there were giant spiders “guarding” the tomb as well. What caused my player to say such a thing was when they had discovered a burial chamber of a great Elven Lord and lying in the grasp of a statue behind the Elf’s tomb was a staff that was obviously magical in nature. They were debating whether to just grab it or whether to not risk it as something may come to life or some trap might activate. I had neither planned as the obstacle to overcome was actually in the prior room where four animated suits of armor had been the guards of the tomb, only allowing those who knew the passphrase to move beyond without a fight. I was actually very pleased when the group decided not to fight them initially and puzzled out the passphrase somewhere else in the Dungeon, returning to collect their prize. All in all the reason I was surprised to hear him say “It’s not like Kevin’s going to throw something at us we can’t handle” was because there were a few potential encounters within this dungeon that could have proven difficult to impossible to handle. The first was the room of animated statues. This would have been a very difficult fight. These were guardians of a powerful magical item and someone of great import’s tomb. This fight was winnable but the rolls would have had to go their way. Solving the puzzle was by far the safest route, and they should certainly be glad they did. The other two factors involved that entrance to the Upperdark of the Underdark. First there were some Gas Spores about the entrance and, if they’d been messed with, would have possibly outright killed everyone in range of the blast and successive chain reaction, and secondly if they had descended much further into the tunnel itself. It was obviously off the beaten path for the night’s adventure, they had important tasks to handle, but there was an allure. Where does this go? Treasure perhaps? They are nowhere near high enough level to make much of a journey down there but hey ““It’s not like Kevin’s going to throw something at us we can’t handle”. I don’t bring this all up as a manner of admonishing the player who said this though. While it rankled at the time it ultimately caused a moment of introspection regarding the games I’d run for him and others in the past. I came to the realisation, and on some level I guess I knew this already, that I really could have earned such a reputation in the past. Most games I’ve run, up until the last few years, were very survivable. I’ve almost never allowed a situation to arise that would result in the loss of a party of players and thus… our story. You see, I am a very story driven player of Tabletop RPGs. Whether I am running the game, or playing a character, it’s what drives my manner of play. In the past, Hell even the recent past, I have been the outright opposite of a “Killer DM”. I’ve certainly let players die before but have only allowed one TPK in my entire run as a DM, and that was in a very recent game of 5th Edition. He had every right to make the assertion that they would be safe venturing downward, all the games he’d been in had always had that safety net. In conclusion I’m writing this to highlight a few points. I hadn’t realized it but my methods had changed somewhere along the line, I began writing things in an effort to be more precise in why they would be facing a certain challenge and I had even allowed for obstacles to either be mortally dangerous or impossible to surpass. 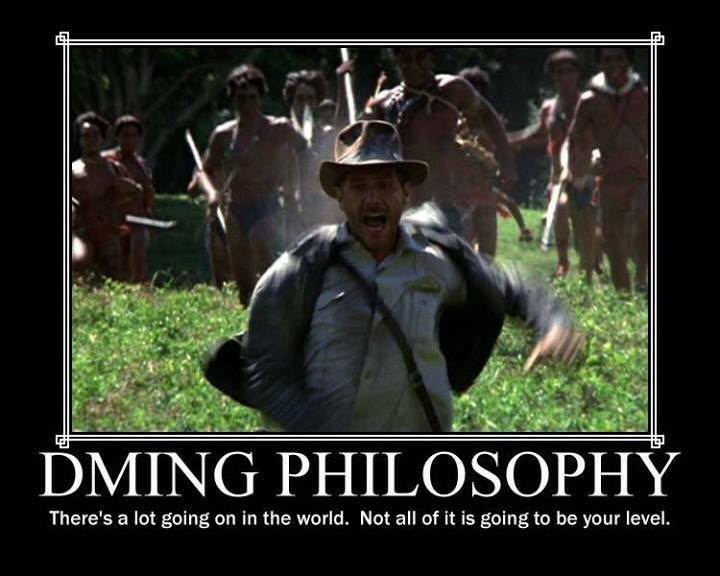 I think I’ve become a better DM for it and I think it may surprise some of my players how their chances at surviving this storyline may take a bit more caution than they’ve needed to possess in the past. They aren’t completely safe anymore, and they need to know that. This entry was posted in Dungeons and Dragons, Friends, Gaming and tagged Dungeons & Dragons, Gaming, RPG by Kevin Smith(@SharnDM). Bookmark the permalink.